“Stomp,” the off-Broadway non-musical musical is on the road again, and those who have never experienced the show are getting a chance to watch a new, and only moderately improved version. The show, playing through Sept. 30 at Denver’s Buell Theatre before moving on to California, Washington, Pennsylvania, remains an artfully constructed tribute to the music all around us. The “Stomp” aesthetic has already seeped into the culture right down to the recently wrapped Summer Olympic games, and every time you make a beat with a tapping pencil you’re part of it, too. No, most folks don’t turn their broom and trash cans into drum kits, but “Stomp” reminds us we don’t need musical instruments to bring music into our lives. Each week, the show runs through 30 brooms, 20 lbs. of sand, two gallons of floor paint and 288 liters of water. And it’s all there on the stage, plus a muscular athleticism that sometimes overwhelms the artistry on display. The show may have its roots in England, but the North American tour has been going on since 1995. “Stomp” creators Luke Cresswell and Steve McNicholas keep tweaking the show’s formula, including the current tractor tire inner tube sequence, but those who saw previous incarnations won’t find the basic beats radically different. The production begins with, what else, the broom segment. It’s a minor miracle the booms don’t snap in two given the sheer force behind the movements. Call it a combination of tap dancing and human beat boxes, but with a fluidity that cushions the angrier notes. Later segments include kitchen sinks (literally), plastic bags, match boxes, paint cans, inner tubes and other items that hardly seem appropriate for the stage. That’s where “Stomp” shines, in making clunky items into rhythm machines. The touring cast features few true standouts, but that’s hardly a critique of anyone involved. The sonic wealth is spread pretty evenly, and there’s no one whose work is less than exemplary. The junkyard set appears similar to earlier “Stomp” incarnations, and it’s only the clever variations on stage lighting that give the backdrop texture. “Stomp” is all about sound, but it’s the silent mugging that give the show its flavor. The performers don’t speak during the show save the occasional cough, shriek or guttural sound. That leaves their bodies to convey emotion, and while there are no characters to inhabit, they exude the kind of hurt feelings and chest thumping that hearken back to the silent movie era. Sometimes, both the comedy shtick and the stomping feel anemic. The show runs less than two hours, and it’s clear the premise is running on fumes in those last few minutes. Do we really need to see these talented performers wave plastic bags and newspapers in the air for their audio qualities? The show appears to wrap with a spectacularly noise-filled trash can bash, only to continue for another five-odd minutes with weak audience participation rituals. 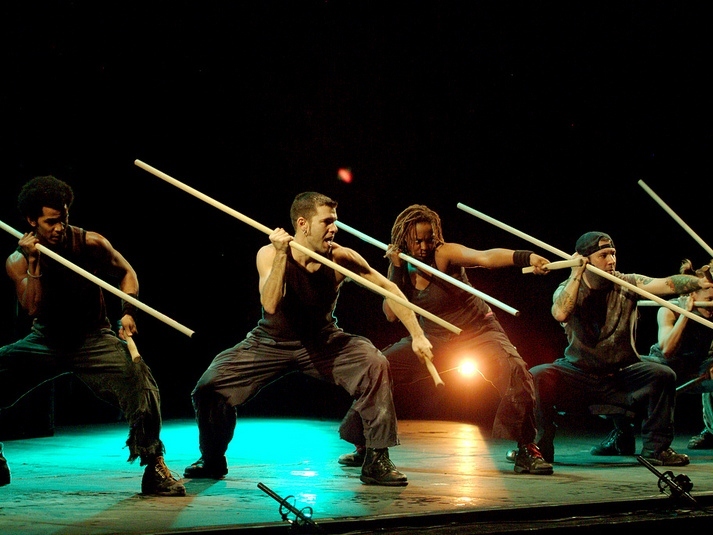 “Stomp” isn’t political in the least, and 99 percent of the act is squeaky clean. You won’t hear a single message rising above the din. An invitation to “Stomp” lets you savor a hardworking group of 12 performers who can make music out of anything thrown their way.